Design Indaba 2018: Child-friendly insulin pen and temporary tattoos make life easier. 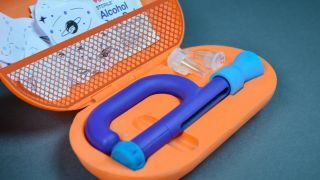 Product design graduate Renata Souza has developed a child-friendly insulin kit for children with Type-1 diabetes. Showcased at Cape Town’s Design Indaba 2018, Thomy is a cheerful, portable kit for kids aged four and over. Inside the kit is an insulin pen that’s been ergonomically designed for a child's hand, and a set of playful, non-toxic temporary tattoos that help children remember where they’ve already injected insulin. According to statistics portal Statista, there were 596,000 children with diabetes worldwide in 2017, with 96,000 diagnosed that year. Thomy adds a bit of fun to the process of managing a difficult condition. The idea for Thomy came about when Souza’s six-year-old nephew Thomás was diagnosed with Type-1 diabetes. “Living with this condition involves altering daily habits, like monitoring glucose levels, injecting insulin, and supervising diet and exercise,” explains Souza. Thomy helps diabetic children have fun while managing their process. Here’s how it works: the temporary tattoos provide a visual indication of where a child has previously injected. The black ink remains on the skin, while a coloured dot is removed with an alcohol pad before each injection – ensuring that the area is disinfected. “After a couple of days, the tattoo will no longer have colour, indicating it’s time to choose another design and rotate to another injection site,” says Souza. This is important, because Souza’s research showed that the injection site must be alternated to avoid lumps of fat developing. Meanwhile, the insulin pen is designed to fit in a child’s hand, and help reduce anxiety associated with needles. It’s fun, and versatile – it can be held in different ways – and, uniquely, the release dial is covered in thermochromic plastic, so it changes colour with temperature. This helps encourage children to keep it in until the full dose has been administered. Souza knew she had achieved her goal when she received a photo of one of Thomás’ brothers – who isn't diabetic – wearing the tattoos too. “Despite the fact that early-age diabetes diagnoses are increasing, there are rarely any diabetic products designed specifically for children,” explains Souza. The project, which was undertaken as part of Souza’s studies at Parsons School of Design, was a national finalist in the James Dyson Award 2017. Read more of our Design Indaba 2018 coverage.